I have been on the management committee of SCEC since its inception in 2012. This came about after I had attended several workshops facilitated by Wendy White from the Normanville Centre. Her enthusiasm really spurred me on. I am passionate about recycling and waste and want to make the environment better for all of us as well as my grandchildren. 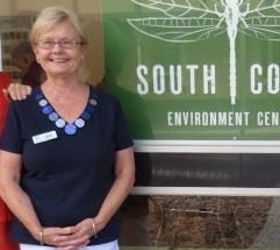 I have also been a volunteer at VH R-7 school for many years as well as a member of Southern Fleurieu Oxfam. One of our main objectives is raising funds for clean drinking water in times of crisis/disaster in the western world.